A recent study finds that urban trees can survive increased heat and insect pests fairly well – unless they are thirsty. Insufficient water not only harms trees, but allows other problems to have an outsized effect on trees in urban environments. “This is important because trees need to grow in order to perform valuable ecosystem services, such as removing pollutants from the air and storing carbon,” says Steve Frank, an associate professor of entomology at North Carolina State University and co-author of the paper. It’s extremely difficult to design a field study that addresses these questions about the role of various environmental variables, given all of the uncontrolled factors in an urban environment. So the researchers used both field data and controlled laboratory experiments. The researchers also found that water stress limited tree growth all by itself. But the presence of increased heat and/or scale insects, when combined with water stress, had a multiplier effect – curtailing growth far more than water stress or scale insects alone. “For example, urban planners could design urban landscapes that retain stormwater in vegetation; invest in hydration strategies, such as appropriate soil quality and soil volume; and plant drought-tolerant tree species and genotypes in the hottest parts of their cities,” Frank says. The paper, “Water availability drives urban tree growth responses to herbivory and warming,” is published in the Journal of Applied Ecology. The work was supported by the Department of the Interior’s Southeast Climate Science Center, under cooperative agreement numbers G11AC20471, G13AC00405 and G15AP00153 from the United States Geological Survey; by the U.S. Department of Agriculture’s National Institute of Food and Agriculture, under grant 2013-02476; and by the U.S. Environmental Protection Agency, under grant FP917482. 1. Urban forests provide important ecosystem services to city residents, including pollution removal and carbon storage. Climate change and urbanization pose multiple threats to these services. However, how these threats combine to affect urban trees, and thus how to mitigate their effects, remains largely untested because multi-factorial experiments on mature trees are impractical. 2. We used a unique urban warming experiment paired with a laboratory chamber experiment to determine how three of the most potentially damaging factors associated with global change for urban and rural trees—warming, drought, and insect herbivory—affect growth of Quercus phellos (willow oak), the most commonly-planted large shade tree in the southeastern US, which is known for its resilience to these potential stressors. 3. In a previous study, we found that the urban heat island effect was associated with reduced growth of Q. phellos and higher abundance of Parthenolecanium scale insects, key pests of oaks in cities. Here, we tested the hypothesis that tree water stress is the mechanism for these effects of warming. We found evidence that water stress is a major, interactive factor reducing urban tree growth, but found no evidence that water stress is associated with Parthenolecanium survival or abundance. Warming and Parthenolecanium only reduced growth in Q. phellos saplings that were simultaneously water stressed. 4. Synthesis and applications. 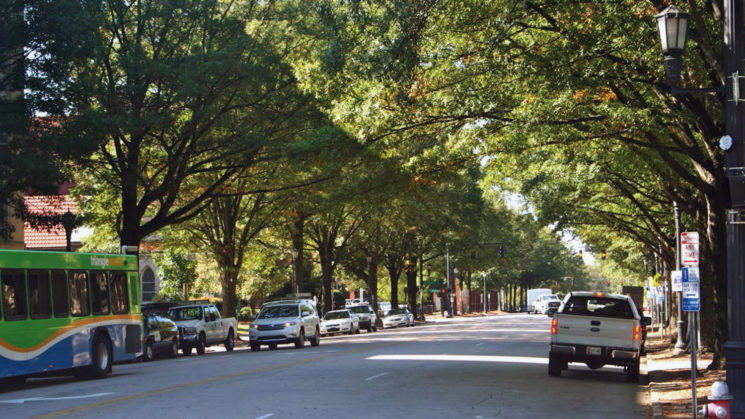 Across many temperate cities, urban trees grow less than rural trees. Our results point to water stress as the most likely driver for this pattern. We found that water stress reduces tree growth and exacerbates effects of warming and insect 47 pests. Therefore, management strategies targeted at increasing tree hydration in cities may reduce effects of these three key stressors as they intensify with further urbanization and climate change. « The Economics of Tariffs: Can Restricting International Trade Be Good For the Economy?